Get beyond the generic resorts, and experience the best of Barbados. One of the most popular and heavily-touristed islands in the Eastern Caribbean, Barbados certainly offers its share of generic resort experiences. In fact, the peaceful west coast, sheltered from the open Atlantic, is devoted almost entirely to high-end, gated resorts, duty-free shopping, and over-priced daiquiris. Fine, if that’s what you came for. But in spite of the heavy development in some areas, Barbados retains a distinct personality, a regional cuisine, some stunning natural areas and plenty of local traditions and culture. If you’d like to experience the best that the island has to offer, this guide is the place to start. Friday nights mean one thing to locals, tourists and ex-pats alike: fish fry time. Friday nights mean one thing to locals, tourists and ex-pats alike: fish fry time. 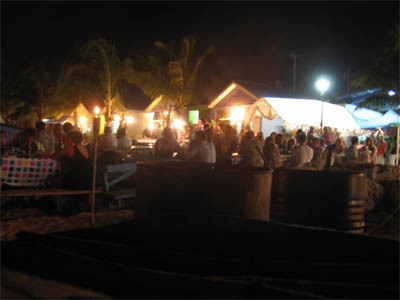 Head down to the waterfront in the village of Oistins (on the south coast, east of Dover and Maxwell) anytime after sundown for a delicious, filling plate of the day’s fresh catch. A double row of shacks serve the crowds, and everyone has their own favorite. Offerings vary from week to week, but red snapper, dolphin (the Bajan term for mahi mahi), swordfish and tuna are all common. Try Annie’s, on the eastern end of the row facing the road, for the best selection of typically Bajan sidedishes, like peas’n’rice, grilled sweet potatoes, or macaroni pie. For an appetizer, check out the “Hot Legendary Fishcakes” booth, in the middle of the row. After you’ve eaten, grab a bottle of island-brewed Banks beer and stick around; a DJ will be spinning the latest soca and dancehall reggae until at least midnight. Shake a leg with the locals if you dare. Just before the south coast turns a sharp corner and becomes the east coast at Ragged Point, you’ll find Bottom Bay, and it’s as perfect a tropical beach as I’ve ever seen. Though there are some new suburb-style housing developments going up in the area, the nearest hotel is miles away and the beach – tucked between rocky cliffs, and reachable by a narrow dirt path – is almost totally undeveloped. I say “almost” because no trip to Bottom Bay is complete without meeting the beach’s resident “coconut guy,” a young local who calls himself Dr. Mongoose. 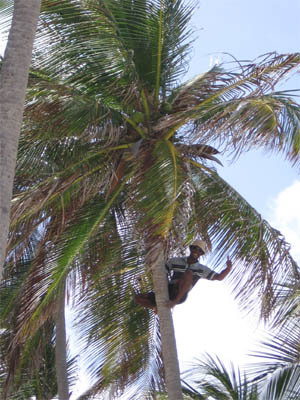 For a small fee, Dr. Mongoose will shimmy up a 30-foot palm tree, bring down a fresh young coconut, and hack it open for you to enjoy the refreshing water inside. He also rents a couple of lounge chairs. Bottom Bay is a little out of the way, and the waves are too heavy for swimming most days, but if you’re looking for a stunning dose of icing-sugar sand, swaying palms, and colors worthy of a Corona ad, don’t miss it. 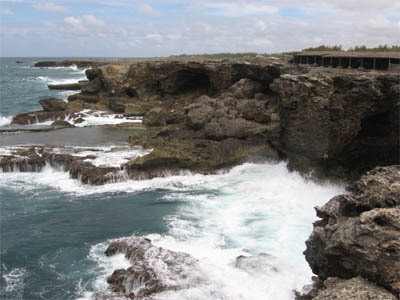 Because the Atlantic surf on the island’s rugged east coast is heavy at best, and legitimately dangerous at worst, this side of Barbados has been largely ignored by developers. The sole exception is the ragged, laid-back little resort town of Bathsheba, which caters to surfers – local and foreign alike – who want to test themselves in “the soupbowl”. The waves here are not for beginners, but even if you’re not a serious surfer it’s a gorgeous spot to while away an afternoon, watching the show. Try the Roundhouse Inn for a beer and a bite to eat (budget tip: listed as a sidedish, the macaroni pie is nearly a meal in itself), or even stay for a night to fully savor the vibe. The Roundhouse, the Atlantis Hotel , and the Sea-U Guesthouse all offer rooms in the area at varying rates. The jagged cliffs and frothy, pounding surf at the island’s northernmost point feel worlds away from the sedate beaches further south. Bring a picnic and enjoy the waves and the wind; wander a couple hundred yards east from the main point to see water being forced out and up into the air through a nauseatingly-deep blowhole. Don’t let any handicraft vendors convince you that you need to pay to visit the point; there is no admission fee, and the parking and washrooms are also free of charge. If you’re going to do fun in the sun you might as well do it right. And Carlisle Bay, on the south coast just east of the capital city, Bridgetown, is the place to go for beachy hedonism: think banana boats, jet ski rides, water trampolines, and more. The action is concentrated at the beach’s western end; rent an umbrella and sip a daiquiri, join the beautiful people already splashing flirtatiously in the water, or pay the cover charge to gain access to The Boatyard, a beachfront club where a sound system blasting reggae-lite (Shaggy, Maxi Priest) keep an all-day dance party going. The best part about Carlisle Bay, though, is that it’s a massive strip of sand: start walking east from the heart of the hedonism, and you’ll quickly find yourself on an undeveloped stretch populated mainly by a sprinkling of local residents. On a Sunday, you might even see a born-again baptism taking place in the shallow, calm water. The Barbados dollar (B$) is fixed at a rate of 2 to 1 with the US dollar; hotels generally quote prices in greenbacks, but Barbados dollars are used most everywhere else. Barbados receives daily direct flights from Toronto, New York, Miami, and London, to name a few. Grantley Adams International Airport is one of the best facilities in the Caribbean; it’s also a hub for smaller carriers serving the other islands. Most of the mid-range and budget accommodation in Barbados is scattered along the south coast, in areas like Rockley, Dover, and the St. Lawrence Gap. Here’s a list of the island’s guesthouses organized by rate – note that costs will vary according to the season. There’s not always a lot to choose from between these budget places, but The Dolphin Inn is recommended, clean and friendly. In high season (roughly mid-December to early April) you may want to book all your accommodation in advance; from late March on, though, vacancy rates will start to rise, and you could probably just book the first couple of nights and then shop around. There are also a number of Couchsurfers based in Barbados. Public transit is pretty good in Barbados, and particularly along the south coast, where large government buses and smaller vans rush up and down the coastal road between Bridgetown and Sam Lord’s Castle. A single fare costs B$1.50. These south coast buses will take you to Oistins and Carlisle Bay; Bottom Bay is not far past their terminus at Sam Lord’s, and is clearly signposted from the road. 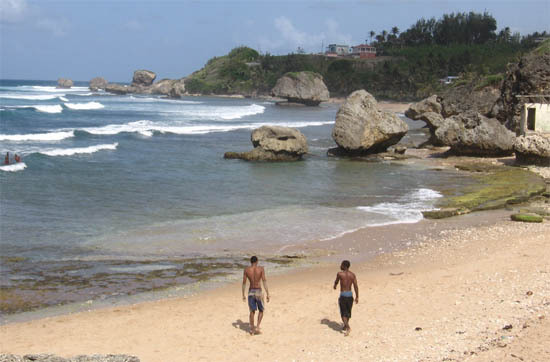 Bathsheba is also served by buses from Bridgetown; ask around for the routes headed up the east coast. North Point is not on a bus route, and you’ll need a rental car or a taxi to get there. Taxis are plentiful, safe, and reasonably priced; agree on a rate for your destination before you set off. Do you want to escape to a beautiful Caribbean island where you can hang with locals instead of scarfing down the travel equivalent of an Extra Value Meal at Club Med? Anna, who speaks French and Swedish and knows the lush jungles and romantic waterfall plunge pools of Dominica. Tony, who eats rainbows and lives in the Virgin Islands with his wife and new baby. Eva, a Canadian travel writer who can hold her own drinking beer with a New Zealand rugby team. Matador is a community of aware travelers who are working together for a better world.